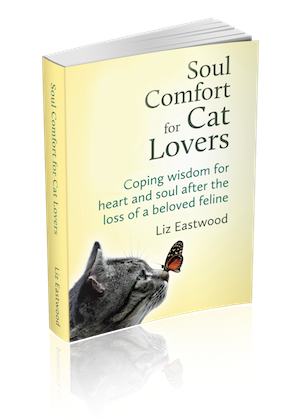 Intro from Liz: Because cats are often misunderstood (and therefore mistreated or unadopted) in our culture, I think cat convert stories are important. When I met Rachel, I was quite charmed by a photo of her and her cat (shown here). She told me he was a special hospice therapy cat. I wanted to know more, and was surprised to find out she hadn’t always liked cats. Welcome to one of my favorite cat convert stories. I had never been a cat lover. Honestly? Not even a cat liker. It goes back to when I was 10. As my best friend’s grey feline sunned itself lazily by the pool, I attempted to cuddle it. Upon being lifted, the cat promptly hissed and dug its claws into my wrist, leaving a generous trail of blood flowing down my arm. I had always been a dog monogomist – an especially interesting contradiction considering my last name is Katz. Ardent cat lovers have pointed out this karmic connection throughout my life. 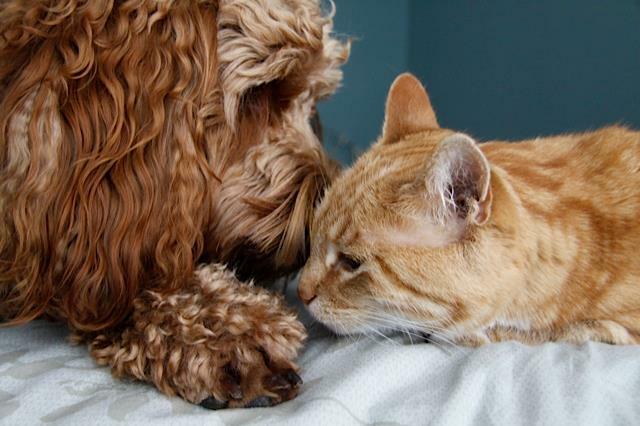 I thought a cat could never bring me the joy of a tail-wagging, adorably affectionate dog. Take my childhood dog Golda, a bright, spunky, tri-colored Welsh Corgi (the breed beloved by the Queen of England). Somehow, Golda seemed to know she had royal roots and reminded us of that fact regularly, especially when she waited by her food dish expecting her weekly serving of Sunday morning waffles. To say we spoiled her was an understatement. When she died of old age at 16, the family was bereft. Years later, my significant other Andy (also a devoted dog lover) and I decided to start looking for a dog. During that same period, my father had to undergo open-heart surgery. When I reminded him I wasn’t a cat person, he countered, “Rachel, this might be good for you!” Andy enthusiastically agreed. Reluctantly, I said yes. Zack was a gorgeous Siamese-tabby mix – white with muted black stripes and stunning blue eyes. To my surprise, we bonded almost immediately; his hilarious, playful antics lifted my mood and restored my depleted spirit after hospital visits with my dad. I could not wait to come home to him. For the next three weeks I visited Zack daily. We would play hide and seek, patty- cake or bat a ball around. If he were in one of his rare mellow moods, Zack would relax on my shoulder while I sat reading on Jeffrey’s couch. There was no doubt about it. Zack was opening my heart to cats. After much consideration, Andy and I came up with a game plan; we would take the plunge and adopt a kitty while taking our time with the puppy search. As soon as my dad was out of the hospital, our feline hunt began. We attended a cat adoption fair, and as soon as we entered the room, a gentle, sweet ginger tabby named Tangerine immediately jumped into my arms and rubbed his face against my cheek. I melted. Because we still had a bit of trepidation about committing to a cat, it took three visits to finally adopt Tangerine. As soon as he was ours we renamed him Bodhi (short for Bodhisattva –“enlightened one” in Sanskrit) because of his serene, Zen-like nature. His name fits him perfectly. Bodhi is a feline Buddha whose unique, loving temperament never ceases to amaze us and everyone else who meets him; we even had him certified as an AAT (animal-assisted therapy) pet. Bodhi’s gifts are many. As hospice volunteers, Bodhi and I visit the bedsides of dying patients. He will quietly lie on patients’ beds as they stroke him or jump into someone’s lap at just the moment they need comforting. When I meditate, he curls up in my arms. Last year when I had major surgery Bodhi became my trusted nurse. He would jump on my chest and tenderly rest his head on my heart as if to say, “I’m here. You are going to be OK!” A friend who’d been struggling with infertility is even convinced Bodhi played a role in her getting pregnant by gently pawing her abdomen while lying on our couch. Three years after Bodhi’s arrival, Charlie, a darling, exuberant labradoodle puppy, joined our furry brood. Though at first uncomfortable with his new, 3-month-old brother, within a few months Bodhi was graciously sharing his water bowl, bed, toys and even parents. Never could I have imagined how much I would love a cat. Bodhi is a kindred spirit and one of my most inspiring teachers. Through his example I have learned greater tolerance, generosity and unconditional love. Do I, Rachel Katz, have a karmic cat connection? Was my last name truly a sign? These things I will never know. But I do know that cats– especially one named Bodhi- has forever transformed me. 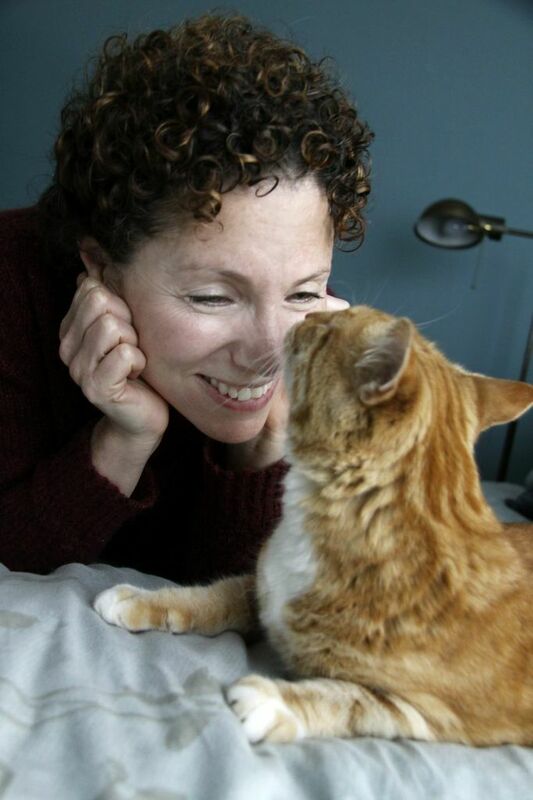 Rachel Katz is a spiritual director, volunteer end-of-life caregiver, singer, pet loss researcher, and proud mom to her beloved dog Charlie and hospice therapy cat Bodhi, her two greatest, most playful teachers. Learn more about Rachel at TheUrbanSpirit.com. Like Teresa, I am blessed to have Rach, Andy, Bodhi and Charlie as dear friends! Rach, dear Bubelah, I had no idea you were converted to adoring cats and being owned by them?! I have a lifelong connection with all cats (and Katz :-). Bodhi is such a special being. I’m also deeply touched to read that Bodhi was Tangerine before you listened and called him by his right name. My dear Merry McGregor was Tangerine when I adopted him. He died about a month ago after serving as soul healer to many. We are so blessed by our “angels in fur”. Thanks for the beautiful story, Rachel Katz, and for the wonderful blog, Liz. I had no idea you had a Tangerine too?! Talk about bashert. 🙂 Thanks so much for your post. Much love! I agree. Thanks for stopping by Layla! It’s a wonderful, heartfelt piece! I can attest to Bodhi’s loving nature–loving parents have certainly nurtured his amazing personality! Thank you for your very interesting and informative website. The recent post about alternative healing of lymphoma in cats was of great interest–my adored cat Murphy died of that disease many years ago. Teresa, so good to hear this. I love these photos and glad to know who the photographer is. Teresa, your pictures are gorgeous as are you for your lovely post. Thank you!